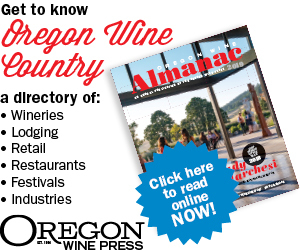 On Feb. 23, some 270 industry members, consumers and media gathered at The Allison Inn & Spa in Newberg for the eighth annual Oregon Chardonnay Celebration. Jason Lett of The Eyrie Vineyards moderated the opening seminar, “Time in a Bottle: The Evolution of Chardonnay,” featuring a panel comprised of well-respected Willamette Valley Chardonnay growers and producers: Robert Brittan of Brittan Vineyards, Ben Casteel of Bethel Heights, Michael Etzel of Beaux Frères, and Kate Payne-Brown of Stoller Family Estate. Each winery supplied two Chardonnays. One was from the cool 2010 vintage, when the grapes struggled to ripen. This proved a late harvest providing food for migrating birds to bulk up for the long flight south at the expense of yields. Care was taken by the sommeliers when pouring the potentially fragile wines: They gassed the glasses with argon and quickly covered them. The other Chardonnays represented a much warmer vintage, either 2015 or 2016; both ripened rapidly and were harvested earlier than normal — in some cases, almost two months before the 2010 vintage. During his introduction, Lett noted the event was being held on “the day that we enter the 55th year of growing Chardonnay in the Willamette Valley.” He told us that early on, his father, David “Papa Pinot” Lett, along with others, actually planted more Chardonnay than the grape for which he is known. Over the years, the percentage of Chardonnay acreage declined from 38 percent in 1981 to 17 percent in 1998, to 6 percent in 2017. While the latest figure might seem insignificant, it is on the rise. In 2014, the number was under 5 percent and has been increasing since. Still, Oregon Chardonnay ranks a distant third in planted acres behind Pinot Noir and Pinot Gris. 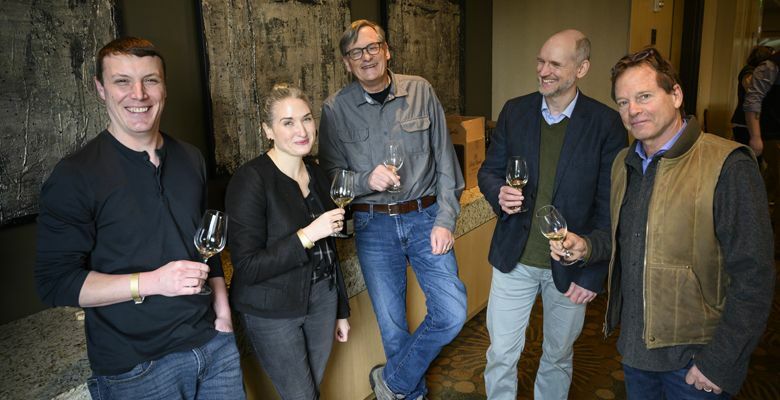 Lett also mentioned how Oregon Chardonnay was a critical early success with noted writers commenting on the similarities to its counterparts in France. He also proclaimed, “Chardonnay is one of the great aging varieties,” a point reinforced by what we were tasting. He emphasized how site, not chemistry, makes Chardonnay age worthy. Brittan, who credited Chardonnay as one of the reasons he came from California to Oregon, shared his 2010 and 2015 Brittan Vineyard Chardonnays. The former offered a youthful nose with a broad flavor palate and long finish. A later visit revealed candied fruit with a hint of anise. The younger wine appeared medium gold, a bit darker than the 2010, and emitted complex aromas of nuts, fruit and spice. The flavors were nicely balanced, delicate and youthful; the finish, long. Casteel presented the 2010 and 2016 Bethel Heights Vineyard Estate Chardonnays. The older wine, which was the only 2010 presented that was bottled under screw cap, showcased a mature nose and broad fruit flavors that seemed to fade. In contrast, the 2016 displayed nutty aromas initially with an unusual wood-like scent later, tasting youthful on the palate. Etzel’s 2010 Beaux Frères Ribbon Ridge Chardonnay and 2016 Yamhill-Carlton Chardonnay revealed skill and talent. With some funk on the lemony, nutty nose, the older wine tasted simply delicious. The classy 2016 showcased a polished, fruity nose and palate. In the past, Etzel harvested at higher sugar levels but now picks the grapes around 20 brix. Kate Payne-Brown contributed the 2010 and 2015 Stoller Family Estate Reserve Chardonnays. The 2010, while showing its age, still drank well. I enjoyed the butterscotch on the palate that emerged with some air. The younger example had a lovely bright nose and round flavors. Payne-Brown underscored Stoller’s approach of exploiting its warmer site to get more fruit but balancing it with good acidity. Fifty featured wineries, including the five mentioned above, shared samples of their Chardonnays accompanied by hors d’oeuvres. I tasted 26 wines from 25 producers. Many were still young yet augured a promising future. Not all the bottles were at optimal temperature nor had enough time to breathe. Nevertheless, in my opinion, these 13 stood out: the scintillating 00 Wines 2017 VGW Chardonnay; the distinctive Bergström 2016 Sigrid Chardonnay; the balanced Domaine Divio 2016 Chardonnay; the lovely Domaine Drouhin Oregon 2016 Roserock Chardonnay; the tasty Dukes 2015 Pearl Chardonnay; the promising EIEIO 2016 Yates Conwill Vineyard Chardonnay; the intriguing Elk Cove 2016 Goodrich Chardonnay; the toasty Flâneur 2016 La Belle Promenade Chardonnay; the really good Johan Vineyards 2015 Visdom Chardonnay; the bright Lavinea 2016 Elton Vineyard Chardonnay; the beautiful Lingua Franca 2017 Estate Chardonnay; the lovely VIDON 2017 Estate Chardonnay; and the complex Winderlea 2016 Chardonnay. Ageability is a hallmark of most great wines. The panelists agreed the 2010 Chardonnays would last for, at least, another five years. I noted above my concerns about the Bethel Heights, though there may be some bottle variation at play. All were drinking well at more than eight years old and some will certainly go a few years longer. My greatest confidence lies in the following vintages: 2013, 2015, 2016 and 2017. These are the bottles I’ve laid down for my grandchildren. Time will tell if we can keep our hands off until the kids are allowed to taste them.